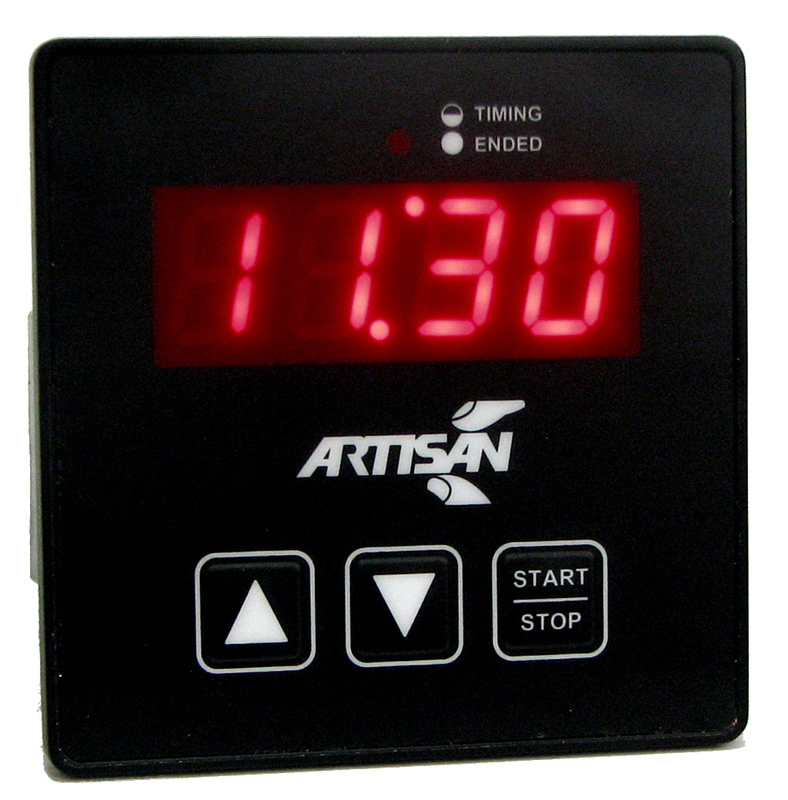 The 4970 is a highly flexible countdown interval timer with digital display of timing controlling a set of high current output contacts. The timing cycle range can be configured for any of the following values: 00:01-99:59 Minutes:Seconds, 00:01-99:59 Hours:Minutes, 0001-9999 Seconds, and 00.01-99.99 Seconds. The two arrow buttons on the front panel are used to set the time, the Up button increases the time and the Down decreases it. The longer a button is held down the faster the rate at which the time value will change, the time value rolls around at both ends of the time range. The StartStop button performs multiple functions. Pressing the StartStop button while the timer is idle will energize the output power relay contacts and the controller begins counting down the time on the display, once the display reaches 0 the contacts de-energize and the unit alarms for 5 seconds and then returns to the original cycle time. Pressing the StartStop button while the controller is timing will pause the controller at the current time and de-energize the output relay contacts. Pressing the StartStop button while in pause mode causes the output relay to energize and the controller continues timing from the point at which it was paused. Should the StartStop switch be held down for longer than two seconds while in pause mode the controller will reset and the display will return to the original starting time. Should power fail during a timing cycle the controller remembers the last time value and will recover upon restoration of power dependant on its configuration. The 4970 always remembers the last interval time programmed and when first powered up resets to that time. The LED above the 4 digit display flashes during the timing cycle to indicate timing and is on continuously when the cycle is ended. The 4970 can be configured with a variety of time range, timing adjustment, alarming, power recovery, and power conservation options.